Get essential hands-on control over Ableton Live with an Akai Professional APC Mini controller. This USB-powered Ableton Live controller serves up 64 clip-launch controls arranged into an 8 x 8 matrix that’s perfect for live performance or remixing. You also get a set of nine, low-profile sliders offering control over volume, pan, and other major functions. 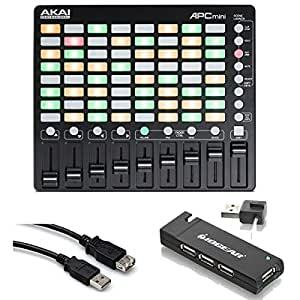 A handy set of soft buttons gives you easy access to controls you need often, and the plug-and-play Ableton integration makes the Akai Professional APC Mini controller intuitive enough for studio and stage.Akai Professional APC Mini controller. This USB-powered Ableton Live controller serves up 64 clip-launch controls arranged into an 8 x 8 matrix that’s perfect for live performance or remixing. You also get a set of nine, low-profile sliders offering control over volume, pan, and other major functions. A handy set of soft buttons gives you easy access to controls you need often, and the plug-and-play Ableton integration makes the Akai Professional APC Mini controller intuitive enough for studio and stage.